The bouquet is reminiscence of cherries, blackcurrants and has tones of dark chocolate. The palate is full bodied with firm but silky tannins. The wine displays an intense ruby red color in the glass. The bouquet is reminiscence of vanilla, cassis, thyme liquorice and mulberries. Decanting is recommended to express the true essence of this Bordeaux blens. Warwick Estate is a family-owned and run winery. From 1771 til 1902, Warwick Wine Farm was known as the farm ‘De Goede Sukses’. After the Anglo Boer war in 1902, Colonel William Alexander Gordon, Commanding Officer of the Warwickshire regiment decided against returning to England and bought the farm. He renamed it ‘Warwick’ as a tribute to his regiment and the rest, as they say, is history. Warwick was purchased on April 1st 1964 by Stan Ratcliffe after an extensive search for the best ‘terroir’ in the Cape. 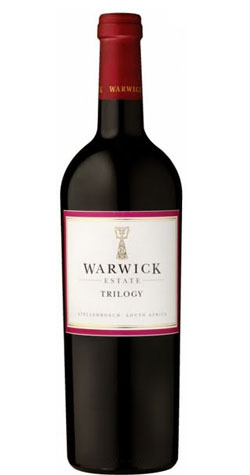 It was in 1986 that the first Warwick Trilogy was released - a Bordeaux style blend which has since become one of the flagships of the South African Wine Industry. Warwick has won many accolades over the years and was featured for a second time in Wine spectators’ wines of the year. From Platter&#39;s of San Francisco, California on 5/23/2016 . Outstanding cab-led Bordeaux-style red, marrying cassis fruit, exotic spice & fine tannins.